readers will find enjoyment on every page. I always enter a new novel hoping that it will be good. This one surpassed my hopes. The story was excellent, the execution of the plot was riveting, and the writing impeccable. Wow… what an exciting read. I was so surprised at how very, very good it was. Dwyer has given us in Requiem. It is all the more absorbing for the perfect ease with which it swims back and forth across time and between its two — or are they two? — protagonists. A brilliant fictive exploration of the power and possibilities of the mother-line. of that achievement. Brilliant book!!! of another age alive and close, making them sensuously real. In resurrecting Shelley and her world, Dwyer transcends the constraints of time to offer not just excellent entertainment, but essential perspective on the power of words and story. Requiem is a marvel. Gothic romance, feminist history, philosophical mystery—it’s perfect for those of us who love to think as much as we love a good story. 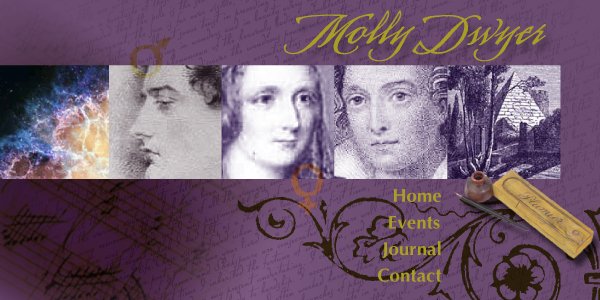 Molly Dwyer brings Mary Shelley and her circle so alive it makes me wonder if they ever died. Haven’t enjoyed a book so much since Possession. In its complexity, its rich character development, its smashing description, it just doesn’t have rival out there today. When Shelley and Byron, Godwin and Coleridge converse, Dwyer’s great gift is evident. Brilliant, just brilliant. There's a book holding me in thrall this week. It's local author Molly Dwyer's novel, Requiem for the Author of Frankenstein: a big, ambitious, remarkably literate and deeply researched novel... that's also a genuinely scary and romantic ghost story. I'm not done yet, so don't tell me what happens. a torrent through its pages. profound and thoroughly satisfying conclusion. not only from the heart, but from the soul. Her meticulous historical research and immersion in place bring all of her complex characters alive on the page. Both an incredible skill with the English language and a beautiful generosity of spirit are evident throughout this inspired first novel. I absolutely loved Requiem for the Author of Frankenstein! It is extremely well written, fully engaging, incredibly stimulating, trés smart, and profoundly spiritual all at once. What a coup! Dwyer deserves much success. I look forward to reading the sequels.